Thunder Bolt Three Point Fixed Blade Knife With Open Hole Pommel | BUDK.com - Knives & Swords At The Lowest Prices! 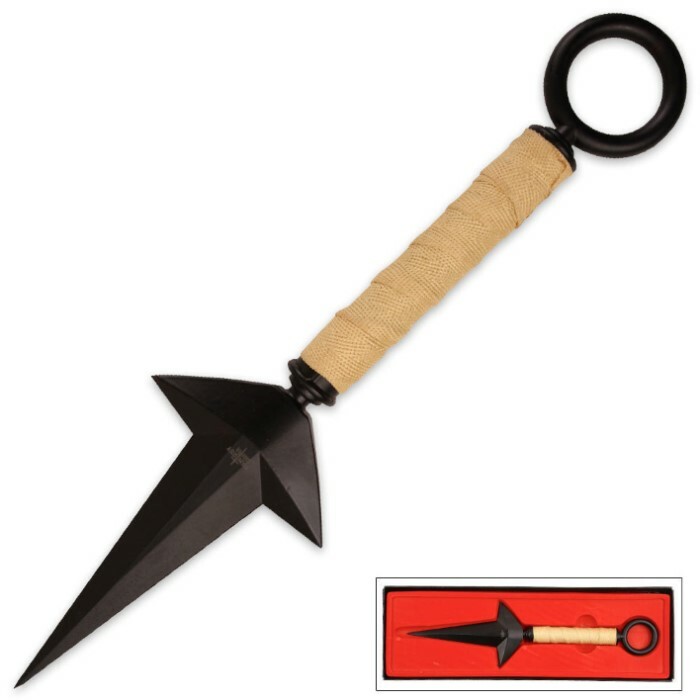 No doubt this is a pretty awesome kunai, especially if you're a fan of Minato Namikaze. But don't expect to do any crazy awesome throwing with it; the metal is too soft and bends easily. If you want it for show, go for it. If you want it to throw, I would suggest something else. Even still, I was still quite satisfied. Good buy! tip bends easy is thrown at a tough substance like a steel shield or something but with skin or flesh it doesn't have too much trouble. (no i did not stab anyone, tried it on a ballistics jell dummy) Good buy if your an anime fan and good wall piece. Only for decorative purpose. Unwieldly and metal is soft and tip bends. Great copy from the manga/anime. It Arived QUITE Fast, But Thats Probably Due To My Location, The Kunai Kind Of Left Me Wanting More, Very Good Wall Hanger, Not Good Weapon. The Blade And ring Are Cast Metal, the Handle Is A Tube With A Metal Threaded Rod Instead Of A Solid Piece, And I Could Literally Bent The Tip Of It With My Teeth, I Highly Reccomend It For The anime Fans That want It As A Display Item, But Not For An Actual Weapon, Very Good Collectors Piece, Nothing More. The ring at the handle is alot larger then I would have liked, and the sides aren't sharp. Feels like its painted. However it has a nice point, and though it's not necessarily something you want to practice throwing on, the 5 times I did it was fine. Though I probably won't try it again. Cannot beat this product for ten dollars. Not meant for throwing, or for fighting in ANY way. For the looks.....looks fantastic. It's definitely not battle ready, the tip bends easy, since its 3 metal pieces its not very sturdy unless tightened beyond the ring and blade being aligned. Other than that its a very nice piece definitely worth more then $10 for the visual appeal alone. Since i don't plan on fighting with it its definitely a 5! the grip is nice tan cotton type wrap on it. smaller then i thought but my hand fits the handle well im 18 and have normal big guy hands so you know. its not balanced at all DONT THROW IT!!!! i just did and broke the tip off FYI i know they say its not im clear on that and its true its made from looks like a mold meaning one peice of metal melted into thae shape. not really sturdy for use in the handle is a bar with two male bolt ends and connects the rin and blade around it is a hallow tube. good for looks and cosplay and ANY anime lover its ok but wish it was bigger and usaubl.